2 March 2018: GENEVA – Some 900 million people could suffer from disabling hearing loss by 2050, according to new estimates released by the World Health Organization on the occasion of World Hearing Day on 3 March. Detecting and intervening early when people do have hearing loss helps to minimize the consequences, especially for children. This is achieved through screening programs. In cases where hearing loss is unavoidable, it is vital to ensure access to appropriate and affordable assistive technologies such as hearing aids and surgically implanted electronic cochlear implants, and communication services like speech therapy, sign language and captioning. World Health Organization (2018). 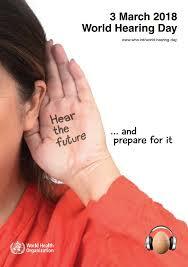 Deafness prevention. http://www.who.int/deafness/world-hearing-day/2018-note-to-media/en/ Excerpt from WHO. Accessed: February 2, 2018.